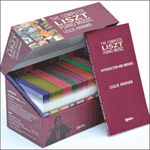 Liszt’s Lucia fantasy turned out to be so large that the original publisher insisted on its being split into two works. Here they are at last re-united by juxtaposition, and thus the similarity of their codas will not go unnoticed. The first part—published as Opus 13 and subtitled ‘Fantaisie dramatique’—is founded upon the closing sextet, and the second upon the scene at the tomb. 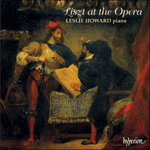 Together they represent the best of Liszt’s early operatic fantasies.